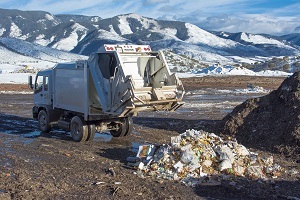 To better understand exactly what our community is tossing into the trash, Aspen and Pitkin County are conducting a Waste Sort this week at the landfill. Elected officials from both jurisdictions will attend the sort on Thursday, July 9th from 8:30am to 9:30am. “We hope to make a recommendation that Aspen and Pitkin County adopt ‘Zero Waste’ policies and one step is to understand exactly what is in our garbage now,” said Liz O’Connell, City of Aspen Environmental Health Department Waste Specialist. “We pride ourselves on being committed to the environment. Being responsible for what we throw into the waste shed is just as important as not polluting our watershed,” she added. The summer sort will be a scientific analysis of a week’s worth of garbage and recyclables. Coming after the Ideas Festival and Fourth of July celebration, the study will help establish a baseline for peak summer conditions. In October, a second sort will identify off-season conditions. Pitkin County and the City of Aspen have contracted with Weaver Consultant Group to produce a waste composition study that will include a summation of the analysis and identify opportunities for additional diversion programs. It will also offer a list of feasible policy, program and infrastructure options for consideration. This is the first time a comprehensive analysis of the waste stream has been done for our community, although an abbreviated waste sort was done in 2009. The primary objectives include discovering ways to maximize waste diversion and reduce contamination in our recycle stream. “We anticipate food scraps will be the largest, divertible, segment in our waste stream and increased diversion will offer the biggest opportunity for significant increase in our overall diversion rate,” said Cathy Hall, manager of the Pitkin County Solid Waste Center. “Waste diversion is a fascinating subject and incredibly important to understanding other aspects of public policy like growth and development. For instance, the Pitkin County landfill has only about nineteen years of life left, at current rates. We can, more cheaply than other methods, extend that time frame by diverting otherwise good material and putting it to beneficial use.” said Jack Johnson, Pitkin County SWC Outreach and Education Coordinator.